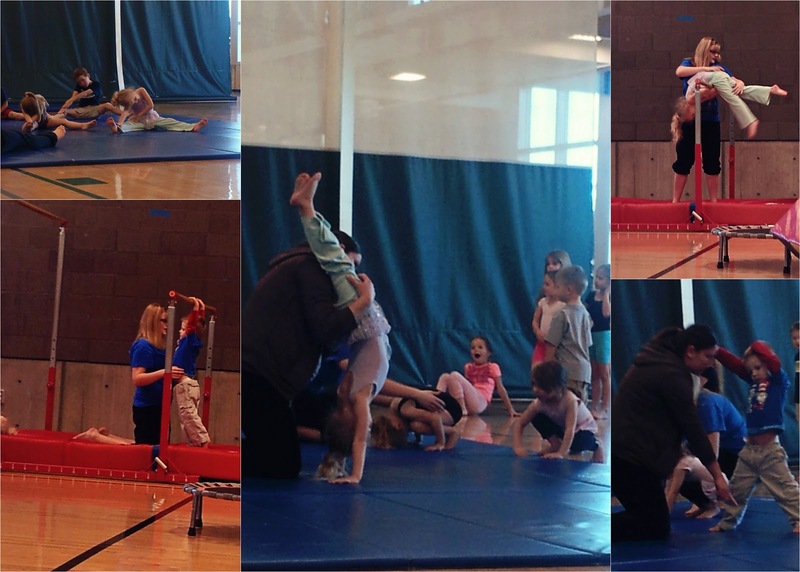 Emilia started taking a gymnastics class at the local recreation center in February. She really loves it. Yesterday we watch a clip of the gymnastic competition in the London 2012 Olympics and she just ooh and aah'd at the athletes' performances. Emilia is a cautious girl so I've been impressed at her inhibition on the beam and bars (always with an instructor's help). Maybe is the positive peer pressure of seeing other kids do it or the instructors' reassurance, whatever the reason she can't wait to go back each week. Last week Carson got to try it as well. He did well following direction but he is still too small to be able to do much besides tumbling. He did have a great time being out there with his big sisters. They kept hugging each other while they waited in line for their turn with the instructor. At home we've been working on her hand stands and helping her learn to do cart wheels. Whenever she tumbles, she gets right back up and tries again. I hope that becomes attitude she learns to implement in other areas and carry with her through out her life.